New wave of Russian emigration: Leave or stay? Within the space of one week, two prominent representatives of the Russian intelligentsia, known for openly voicing their disagreement with the authorities, have announced their political exile. In early June, former world chess champion and opposition leader Garry Kasparov stated at a press conference in Geneva that he currently had no plans to return to Russia. A week earlier, the same decision was taken by Sergei Guriyev, one of Russia's most authoritative economists. 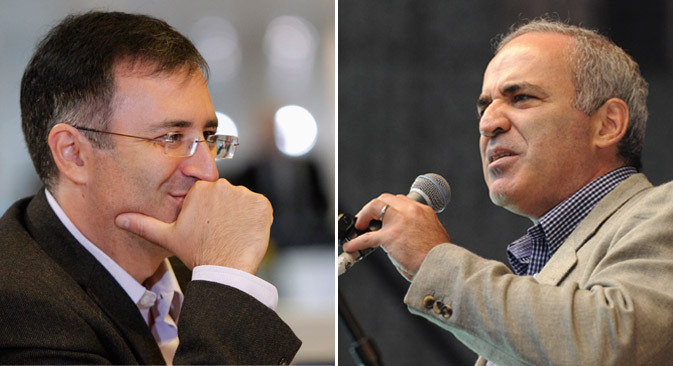 Speaking about their self-imposed exile, Kasparov and Guriev made it clear that they genuinely fear persecution on political grounds in Russia. According to one of the leaders of the "Solidarity" opposition liberal-democratic movement, Ilya Yashin, around 50 protest activists have fled Russia in the past year, fearing arrest. Guriyev, who constructively criticized the authorities yet cooperated with them, is the first member of the elite to emigrate. Ilya Yashin's stay-or-leave choice came a year ago, when he was summoned for questioning after a search. "The day before the interrogation, a journalist from a state-owned news agency called and said that she had seen a press release about my arrest, dated the following day," recalls Yashin. "I had a difficult night of reflection, but made my choice — I wasn't going to run or hide from anyone." The same choice was made by civic activist Alexei Navalny, who is rapidly gaining popularity and widely seen as potentially Vladimir Putin's most dangerous opponent. Before laying five criminal charges at his door and conducting searches of him and family members, the authorities made it clear to Navalny that his presence in the country was not desirable. Since last July, Navalny has been under "house" arrest in Moscow as a defendant in a case of timber theft, which many describe as politically motivated. In the opinion of former Finance Minister Alexei Kudrin, "the indictment calls into question the foundations of market relations in Russia." To stay or leave is a personal decision. "The ones who run are deserters — they'll be bad citizens in any country. Because they've already lost their main war," said Valeria Novodvorskaya, a member of a dissident movement who was repeatedly arrested for anti-Soviet propaganda and placed on involuntary treatment in the 1970s and 80s, in an interview with radio station Echo of Moscow. "A civically active person should do his or her best to avoid landing in prison – Russia’s penal system is tailored to humiliate people, destroy their personality and break their will, which is why of course no sensible person should voluntarily deliver themselves to this grinder,” says journalist and publisher Sergei Parkhomenko, who, like Ilya Yashin and Alexei Navalny, is a member of the Opposition Coordinating Council. These days, through technology it is possible to stay in touch with supporters back home, however, when abroad, a person loses their sharpness, distinctiveness, and insight into what is happening in the country, admits Parkhomenko. In general, the trend of applying pressure on civically active people in Russia who express their own point of view about the country goes back many years, he asserts. "Now it has reached such a degree that people who once seemed fairly well protected have become unsure," says Parkhomenko. A different view is taken by sociologist Olga Kryshtanovskaya, who in 2009 joined the ruling pro-Kremlin party United Russia. "There is no longer any need, as there was in Soviet times, to emigrate with fanfare, never to return. Nowadays you can live where you please," says Kryshtanovskaia. In her opinion, Kasparov's statement on emigration is a "PR stunt... Kasparov spent most of his time abroad anyway." "It would be more in the Kremlin's interests to keep people like Kasparov in Russia and to demonstrate that they do not enjoy much support here," says Professor of Comparative Politics Nikolai Petrov of Higher School of Economics. “By pushing them abroad, the authorities turn them into political exiles, artificially raising their political capital." During a press conference on June 4, in response to a question about the threat of prosecution facing Guriyev, Vladimir Putin said that he had only recently learned of him. Incidentally, before his departure Guriev, who headed New Economic School, one of the leading economic institutions in the country, was also in the list of the top 100 members of the presidential administrative elite. Putin added that if Guriev had "not violated anything, he was 100 percent safe." "If he wants to come back, let him come back. If he wants to live in Paris, he's free to do so," said the president. "The fact that he's been forced out of the country and that Putin is demonstrating that he's not particularly needed here is a very negative signal for many other experts in Russia," remarks Nikolai Petrov. "But the signal is not registered by Putin's electorate. None of them knows who Guriev is." According to Olga Kryshtanovskaya, "Putin wants to emphasize the lack of drama, and show that this person is not such a big cheese in a political sense for the state to go after him."